The Gene Siskel Film Center’s annual European Union festival is ending, and, alas, I managed to see only a few of this year’s films. One of them was the remarkable In the City of Sylvia (En la Ciudad de Sylvia) by Spanish director José Luis Guerín. This profound film is about voyeurism, but not the Peeping Tom variety of voyeurism that drove the plots of films such as Rear Window and A Short Film About Love. Rather, this is the sort of voyeurism that happens in plain sight, strangers watching and studying one another’s faces in streets and cafés. Is that a universal game? I know it’s one I play all the time – looking over at people in a bar or restaurant and wondering what their stories are, wondering what sort of relationships they have with each other. Sylvia captures the mindset of watching strangers with a natural sense of realism and some subtle humor. 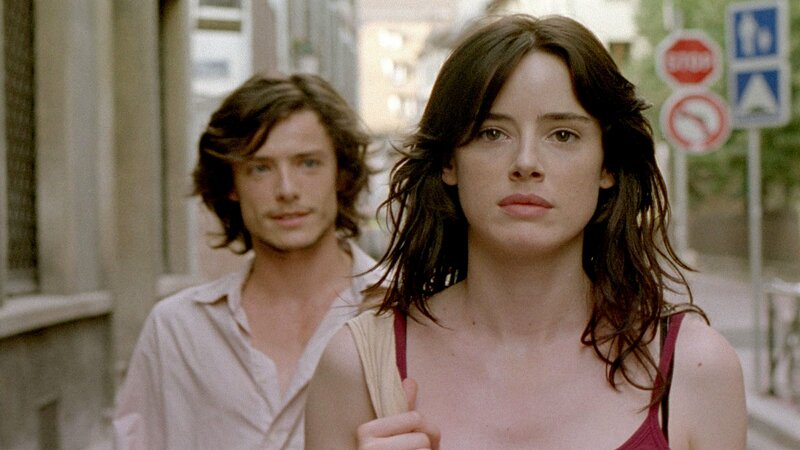 The entire film is little more than a depiction of a nameless young man with a sketchpad (Xavier Lafitte) looking around Strasbourg for a woman named Sylvia whom he met once in a bar six years earlier. After spending a long time watching the various “elles” at a café, surreptitiously sketching their faces, he fixates on one particular woman (Pilar López de Ayala), believing she is Sylvia. As she gets up to leave the café, the man follows. A long chase unfolds, with the man awkwardly hesitating about approaching the woman but persistently walking behind her. In a very understated way, the chase becomes dramatic and suspenseful. Finally, almost an hour into the film, comes the first scene with any real dialogue lasting more than a few lines. Although the humor in Sylvia is never as brash as anything Jacques Tati did, the film did remind me of Tati’s films occasionally, especially Tati’s Playtime. In addition to its visual gags and a wonderful sense of the camera as a subjective viewpoint, Sylvia features subtle layers of sound. Overhead conversations, mostly in French, drift by, almost always on the periphery of the main character’s hearing. In the City of Sylvia is one of those rare films in which little seems to be happening, and yet so much is happening under the surface. It’s a provocative exploration of the way people view the world around them. The Siskel Center’s EU fest also included a companion film by Guerín, Some Photos in the City of Sylvia, but classifying it as a film may be too generous. It’s a collection of still photos Guerín took in Strasbourg and other cities, when he was apparently going through a real-life situation similar to the one depicted in his movie, searching for a woman he’d met long ago – in this case, 22 years ago. Guerín sure seems to enjoy photographing women from behind as he follows them down European streets (assuming that the protagonist, if you can call it that in this minimalist piece of work, is actually Guerín). Some Photos is completely silent, with Guerín’s words occasionally flashing on the screen, and so it seems more like a slide show than a movie – more like an extra feature that would belong on the eventual DVD of In the City of Sylvia. Even as a DVD extra, it would benefit from some sound or actual narration. It may be worth seeing as a sort of sketch for the actual movie that Guerín made, but the way it has been assembled is simply too plain.